Group 13 (IIIA) consists of boron, aluminum, gallium, indium, and thallium. Boron is a metalloid, but the other elements are metals. All elements in this group have three valence electrons. Because these elements have varying properties, they will be studied element-by-element, rather than as a group. A borax crystal. Borax (a mineral containing boron) has many uses including laundry detergent. Boroxin. Notice boron's three bonds. Boron is a metalloid, exhibiting characteristics of both metals and non-metals. 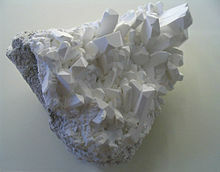 It is never found in its pure form in Earth, but it is a component of some minerals. However, pure boron can form as a result of chemical reactions. It can be a brown amorphous solid, or a crystalline solid. In the crystalline form, it is black and very hard. Boron is a poor conductor of electricity at normal temperatures, but at high temperatures it does conduct electricity. Its chemical properties are mostly, but not entirely, non-metallic. Boron is the least electronegative non-metal, so it readily loses electrons when reacting. Boron is almost entirely in the +3 oxidation state. Boron has an oxide B2O3, and it is acidic. Boric halides are volatile substances that attack water with the formation of boric acid B(OH)3 and hydrogen halides. Boric acid reacts with water to release a proton. It is a weak acid. Boric oxide, at extremely high temperatures, can react with carbon to form boron carbide. Boron carbide is incredibly strong, finding use as tank armor. In a manner similar to carbon, boron can form stable covalent network solids. Each boron atom bonds to three other borons, forming a large crystal. Boron has interesting properties when it bonds covalently. It has three electrons, so it usually forms three single covalent bonds, an exception to the octet rule. Substances like boron trichloride (BCl3), boric acid, and the borate ion (BO33-) are examples of boron's tendency to form three covalent bonds. Aluminum (British spelling aluminium) is a metal, although it is too reactive to exist in pure form. Instead, it is found in a wide variety of minerals including bauxite, the primary source for extracting aluminum. Aluminum is the third most abundant element in Earth's crust. Unlike boron, aluminum is an almost stereotypical metal in its physical properties: it is malleable and ductile, and it conducts heat and electricity very well. Because of its lightness, resistance to corrosion, attractiveness (approaching that of silver), and inexpensiveness to process along with adequate strength for many commercial and domestic uses, it is the third-most used of all metals. Only iron and zinc exceed it in production. Aluminum compounds typically exist in the +3 oxidation state. Because of its durability and light weight, aluminum is used in many alloys, mixtures of metals. Two metals, each with desirable characteristics, can be mixed together to produce an alloy that has the properties of both metals. Aluminum used to be used for household wiring, but it expands too much when heated. The expansion causes the wires to come loose, and house fires can start. Aluminum seems unreactive because of a thin, hard surface of aluminum oxide Al2O3 which does not react with water or oxygen and preserves the aluminum metal underneath it from chemical attack. Pure aluminum will immediately form this layer when exposed to air. Although aluminum is very conductive, aluminum oxide does not conduct electricity. Aluminum oxide is amphoteric—it reacts violently to neutralize strong bases or strong acids. Reacting aluminum with a halogen results in an aluminum halide. Aluminum chloride can exist as an ionic solid or a covalent solid, but either way it is a weak conductor. Aluminum chloride is a Lewis acid, able to neutralize bases. Molten aluminum reacts violently with some metal oxides in the thermite reaction, in which a substance like iron oxide is reduced to iron and aluminum is oxidized to its oxide. This is a highly exothermic reaction, releasing enough heat to weld metal. Generally, aqueous aluminum is found as a hydroxide Al(OH)3. Gallium is a brittle metal that melts slightly above room temperature, so holding it in your hand would liquefy it. One magic trick, the 'melting spoon' involves stirring a hot liquid (usually hot water) with a spoon specially made of gallium. The spoon melts in the water and 'disappears'. (The gallium simply sinks to the bottom of the cup; after the magic trick is done the 'magician removes the water and the molten gallium and pours the gallium into a mold that makes a new spoon for doing the trick again). Gallium is used in many semiconductor devices and LEDs (light emitting diodes). 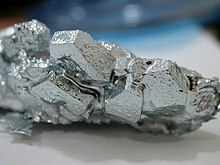 Gallium(III) arsenide is an important semiconductor used in many electronics. Indium's most common isotope is radioactive and decays slowly into tin. Indium typically has the +3 oxidation state. Thallium tends to appear in the +1 (thallous) oxidation state as well as the +3 (thallic) oxidation state. Oddly, thallium acts much like an alkali metal in its physical and chemical properties. Thallous oxide (Tl2O) and the metal react violently with water to form a hydroxide TlOH that completely dissociates into Tl+ and OH- ions as if it were an alkali metal hydroxide. Its halides are quite salt-like, dissociating into ions into solutions that, like solutions of salts of the alkali metals, conduct electricity. Thallium has a violent reaction with water that could release enough heat to cause flames, and may produce explosive byproducts like hydrogen gas. Thallium hydroxide that results from this reaction is as strongly alkaline as alkali-metal hydroxides and is similarly corrosive. In addition, thallium compounds are extremely toxic. Neither thallium metal nor any thallium compound is readily available in the United States because it is so dangerous and has few legitimate uses.